On February 25, the seventh grade music ensemble performed Journey’s “Don’t Stop Believin’ ” for their peers during the Monday meeting. 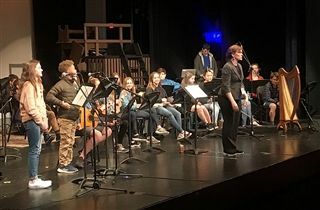 The performance featured guitar, ukulele, electric guitar, electric bass, drum kit, congas, bongos, hand percussion instruments, harp, keyboards, and solo voice. Congratulations to all on a very successful performance!